One of the first questions people ask is, what’s the best type or kind of latex for a mattress? The answer depends on what you want the latex to do, here is our guide to the two main latex mattress manufacture methods. There are two main methods of producing latex sheeting. Dunlop (also known as Dunlopillo due to the confusion with the brand). There are some differences in the manufacture and properties of the end product that you need to be aware of. There is also a detailed article here on the multitude of other latex blends and marketing terms. Is created when liquid latex is poured into special moulds which partially fills them. They are then are vacuum sealed and the air is removed, this makes the latex expand and fully fill the mould. The latex is then frozen at -30 degrees. Co2 gas is then blown through the mix which makes it harden and it is finally baked at 130 degrees to finish it. It is then washed to remove additives and solvents. Why is Talalay latex so expensive? This is because the manufacturing of Talalay is limited by the size of the mould. Also, the process by which is is baked is more expensive than the Dunlop method. This often leads people to believe that ‘Talalay is the best type of latex’ or ‘Talalay is better than Dunlop’. Which is quite confusing. Due to its higher price people have confused Talalay with being the best type of latex which isn’t always the case. Talalay is better for softer comfort layers, but you would need far more of it to get the same support you can get with Dunlop latex. Thus, the overall cost of a like for like mattress in Talalay would be higher as you would need more Talalay to get the same support, granted the top comfort layers would be softer. There is also an argument that Talalay isn’t as robust as Dunlop latex as it is softer, but again by the time you’re looking at 100% natural latex the differences are very minor. Liquid latex is mixed with soaps and air to get the desired density. A gelation agent is added to turn it solid as it is poured onto a conveyor belt or mould and then vulcanised, baked, in an oven. Once baked it is then washed to remove soaps, additives and solvents. Then oven dried again on the conveyor belt and cut to the correct size. Dunlop is incredibly progressive in its comfort and can provide support with lower amounts of latex when compared to Talalay which reduces the cost to the consumer and depth of the overall mattress. Dunlop is also considered the most robust of the two types giving a slightly firmer feel to it compared to Talalay. What is the difference between the manufacture methods of latex? Another valid question which is shrouded in some mystery and personal preferences. Another good comparison is what’s the difference between bottled and tap water? To most there won’t be any noticeable differences unless you have a super sensitive palette! Others will swear to know the difference and have their own preference. In a nutshell, Talalay is a softer latex than Dunlop, which is usually firmer with more progressive comfort and support. Talalay is the most expensive Latex type and is often a blend, with 100% Natural being rare. With latex, the end product has the following differences for each method. 2. Dunlop offers better progressive comfort, i.e. the deeper you go the firmer the feel so you won’t need as thicker core as a Talalay mattress, which is far softer, for the equivalent comfort. 3. Talalay is the most expensive production process due to the methods described above. Due to this, it has led to only being supplied to a select number of manufacturers who used to pay the premium for having this material. This has led to some people claiming that Talalay is, therefore, the highest quality as only a few use it. 4. The Dunlop method offers a wider variety of products due to its manufacture method and it can be produced to almost any dimension. The energy usage is 4 times lower than Talalay. There is an argument that Dunlop latex is more environmentally friendly than its Talalay equivalent. 5. Talalay offers better breathability; though given how incredibly breathable Latex is this benefit may be minimal in the mattress context. 6. Dunlop is argued to be more durable and resilient than Talalay. Meaning that 100% Talalay isn’t as robust, due to its softness, compared to Dunlop. This is because Talalay is lighter by nature, less dense than Dunlop so isn’t as durable. See our density guide here. What latex does John Ryan Use? 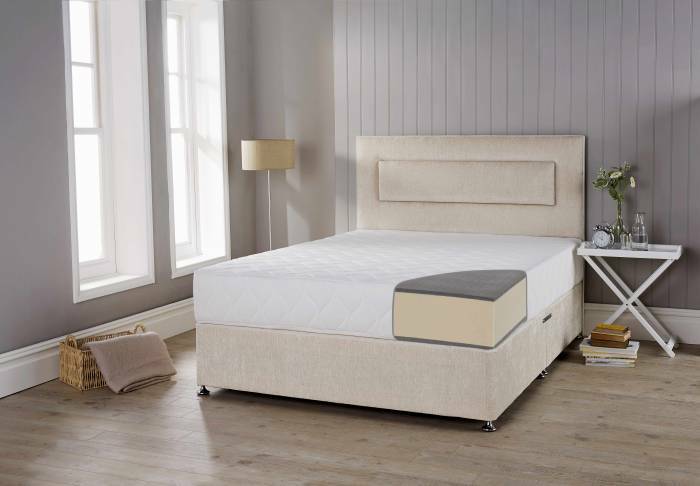 Our Latex is manufactured using the Dunlop method as this offers the best progressive comfort for a latex mattress without having to pay premium amounts. We do offer a Talalay latex topped pocket sprung mattress but all our solid core Fusion Range mattresses are solid core Dunlop Latex. We only offer a 100% natural latex. Other retailers will use a 60% natural 40% synthetic blend as their top end ‘natural’ offering, again you need to ask the right questions to find out. By the time you’re looking at 100% natural latex the differences will be small and then it rests on your personal preference. As always, we are providing you with the information you need to make an informed choice and not be misled or confused when choosing a quality natural latex mattress. 1 – Latex, in its pure form, is derived from the rubber tree. It is a premium mattress material in part due to its resilience and exceptional comfort. 100% natural latex is the best latex you can buy and most retailers will only offer a mix of natural to synthetic to keep costs down. Some manufacturers will claim 100% latex, which in some instances is 100% synthetic. You need to ensure you check the percentage of natural latex, if it doesn’t say it probably isn’t! 2 – Not all latex is the same. There are many derivatives of Latex such as Graphite (grey) Latex, Synthetic Latex (made of chemicals) and Natural to Synthetic mixes all of which dilute or change the Natural Latex properties. 3 – Latex is incredibly breathable and offers more progressive comfort than other materials in a mattress. 4 – Latex can be manufactured by either the Talalay or Dunlop method. Dunlop allows more progressive comfort whereas Talalay is marginally more breathable but softer. 5 – All latex mattresses in the UK need to be made fire retardant and certified. This is usually via a coating, fireproof cover or being mixed with graphite. We use a thin 1cm graphite latex layer on top of our natural latex to comply with the FR. This means your core mattress is still solid core latex but complies with the necessary regulations without sticky chemical sprays or synthetic mixes. Talalay latex is softer than Dunlop latex but carries a higher price tag. Dunlop is much more progressive and you need less of it to get the same support you could get from Talalay. Again, it is personal preference but if you have any other questions please get in touch with our expert team to assist you.